I am experiencing some difficulty uploading lots of pictures right now - just in time for Bloom Day, unfortunately! 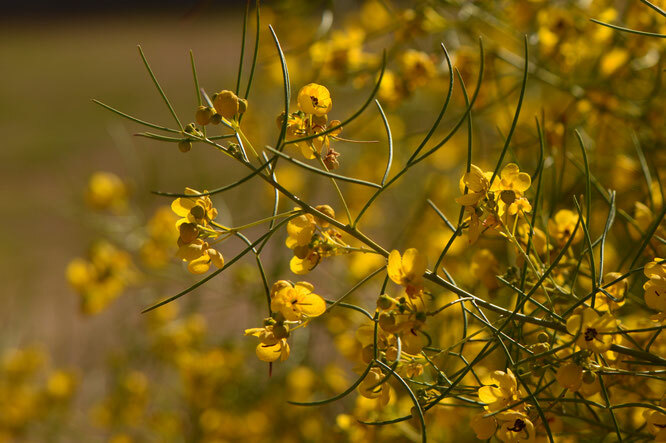 So instead of a comprehensive view of what is blooming, here is a look at the most noticeable flowers, plus one or two deserving special mention. First are a couple of more or less everblooming plants - the ones that show up in almost every Bloom Day post. 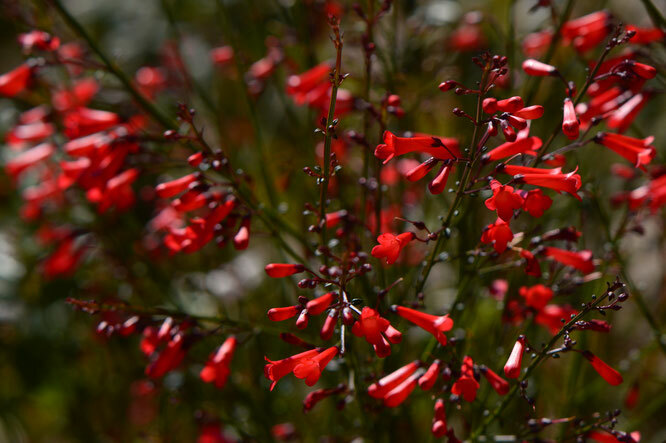 Above is Eremophila hygrophana; below is Russelia equisetiformis "Big Red". More scarlet comes from one of the miniature roses, this one completely unknown but proving quite garden worthy. 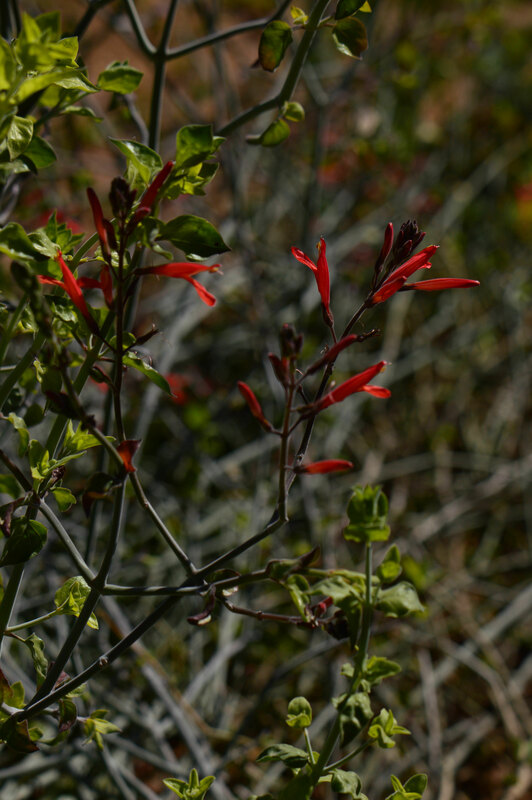 Even more scarlet comes from Justicia californica, lounging about in the North Border. Its growth habit is fairly unusual: masses of sparsely leaved, succulent, easily broken stems form an open tangle of growth from which the brillant flower color beckons to the hummingbirds. 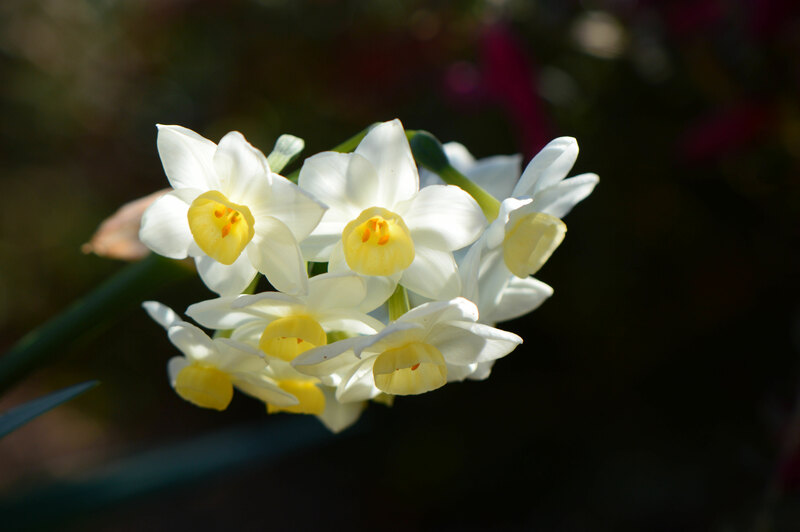 In a more delicate vein are these tazetta narcissi, a perfect cluster despite their tendency towards the diagonal! The pink bits behind them are from Eremophila maculate "Valentine", unfortunately no pictures of it today, but rest assured it is blooming! And the most spectacularly flowering plant of all just now is Senna nemophila. It has been in bloom since December, but it is a froth of yellow now. Happily, it is fragrant too, and there is enough bloom to keep the air around it scented. But there is February's look at what is flowering in the garden, to link with the meme at May Dreams Gardens. Happy Bloom Day! 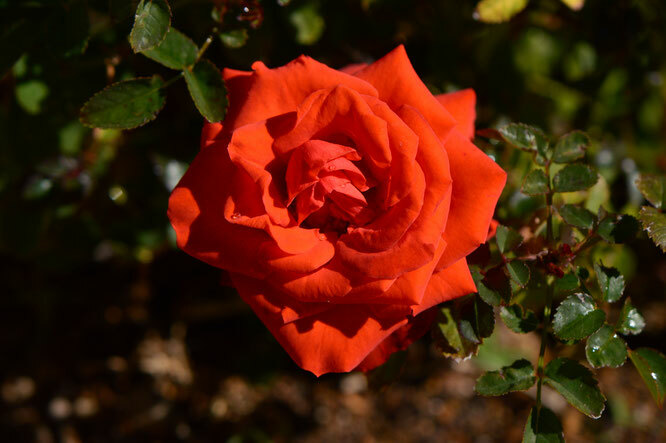 Thanks for sharing your blooms with us for bloom day! Your photos may be few but the flowers all shine brightly in them. 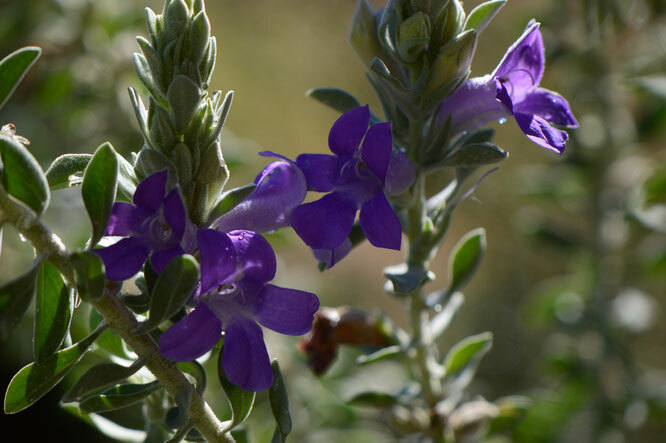 I remain exceedingly envious of that Eremophila - I don't think mine has grown an inch in the past year. It is quite striking the reds and blues in your garden colours Amy compared to the more softer spring colours we currently have. Love that tazetta narcissus, what a beauty it is! Annette - I fell in love with the first Russelia I saw when I began the garden here ;-) It is a cold-tender plant but otherwise quite vigorous and tolerant of a range of conditions, being a native of more tropical regions. So sorry about the long delay in replying! Hope you are having a lovely weekend! Carol - Thank you for creating such a wonderful and useful meme :) and thanks for coming by! Cathy@Words and Herbs - The light has been glorious lately :) I do wish I could post the Senna fragrance; it's been a pleasant surprise, and this is the first year there's been enough bloom to get it airborne. Brian - I do find that the strong colors work well here, but truth to tell most of those reds are my attempt to feed hummingbirds, who love the really bright ones! I'm so glad you enjoyed them, Frances! It's always fun to see what will be blooming together in this garden ;-) So glad you stopped by!